We can organise so we only have the vehicle up to 2days If that helps. Edited by BenTTU, 24 December 2018 - 05:37 PM. What boost is this turbo running to achieve a comfortable 500 Ben? is the turbo within its tolerances running that sort of boost on a daily basis? Edited by Caney, 25 December 2018 - 05:39 PM. To get the best out of the stock turbo you need to push it hard due to the restriction from the manifold, it's the same results as running a bespoke turbo. You need to push them to see the best results. We have no worry at all with this, our first unit developed is coming up to 12 months old and still going strong. We give a warranty with our product with no obligation, I don't see any body else standing that strongly by there product. Sorry if any spelling mistakes, brandy has been my best friend today. Tonight I did 1/2 mile in 17.97, I was happy with this as FL RS3 running E85 are running in the 17s. Another 1/4mile run, I'm convinced I can get this into the 10s down a drag strip. Applying a 15% forum discount to this product. just a update for you, we are now doing some extra work to the manifold for smoother gas flow, to ensure maximum reliability. My car as you would imagine gets a very hard time, with over 40 launches since i have fitted my TTU510S and no problems at all. If any body is on the bench about going down this route, and would like a preview of what the TTU510S is capable of please come down and see us. I will be more then happy to take you out. After my 8p had a health check here and was given the good news that my remap can be sorted properly at last, I was very privileged to have been taken for a blast in the awesome RS3 owned by Ben. Three weeks later I’m still telling people how impressive this mod is and can verify it’s blisteringly fast and with no lag it’s face distorting from standstill, when I upgrade to a facelift I’m giving this serious consideration, if her indoors will let me!!! Any time matey, just let me know as I'm not in it every day. 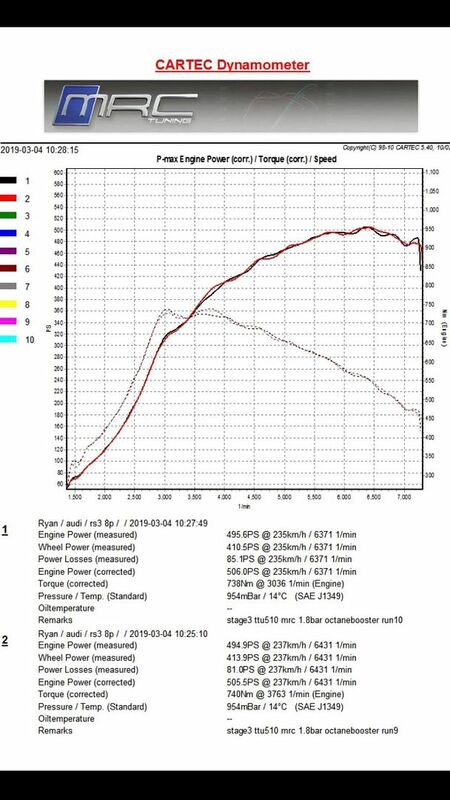 Here is another TTU510s making good power with MRC software. This RS3 8P is running a stock back box with a Wagner evo2 cooler and only running 1.8 bar of boost, MRC held the power back to keep it safe due to stock pistons on the 8p.